It was certainly a hot game in all meanings of the word. With the heat making no dent on the high energy and intensity of a typical, full powered, roller derby game. With the crowd in place, ready with signs of support, our outside voices prepared to roar – and boy did we use them! It started off with a bang. Big hits from both sides, with jammers using full force to break through some well structured walls. Belles took the lead with a couple of swift jams, a combination of strong, slow and calculated blocking against Surrey’s jammers, paired with some nifty, torpedo jamming to break through Surrey’s wall formations. 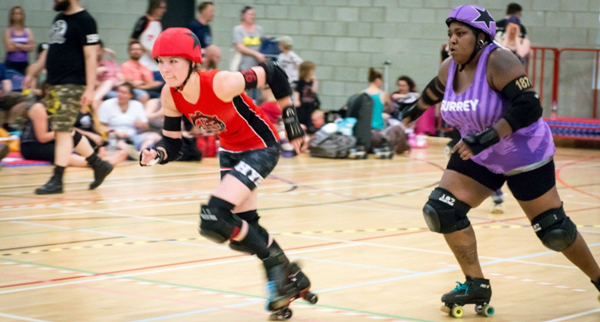 With the Belles’ jammers securing lead status, Surrey were quickly reforming back into their walls to prevent the Belles from scoring further points. 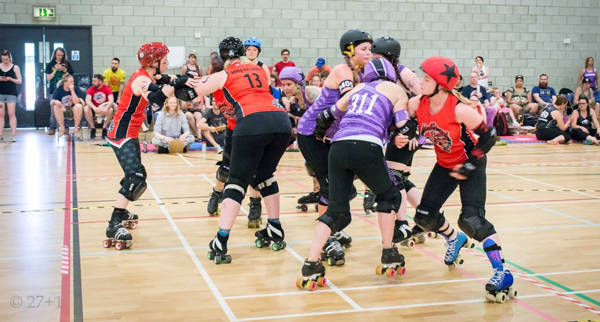 Meanwhile, the Belles’ blockers where focusing on holding, recycling and knocking the Surrey jammers off track. However, some Belles got a little too friendly with the penalty box in the first half, serving 16 penalties to Surrey’s 9. The first half ending in Hertfordshire Hell’s Belles 155, Surrey Roller Girls 26. The 2nd half began with the Belles taking lead jammer status 3 jams in a row; this was a half full of star passes. Surrey completed a total of 5 successful star passes to their pivots, getting their jammers out of the pack. The Belles also used a number of star passes or stashes. The second half saw the temporary loss of the Belles’ jammer, Dodge, who had incurred a minor injury, so had to sit out for a few jams. The Belles continued to hold the fort down with Cole and Bex Pistol jamming in rotation. Bex Pistol sharpened those devil horns with an impressive 30 points jam, the highest scoring jam of the entire game. The Surrey Roller Girls gave back some great punches in the second half with some blockers taking on jammers single handedly, whilst doling out some well coordinated offence to get their jammers out of some difficult walls. The official final score Hertfordshire Hells Belles 344, Surrey Roller Girls 51. Both teams played with vigour, energy, and pride. It was an absolute cracker of a derby game and in what was one of the hottest days in June, a huge achievement for both teams. 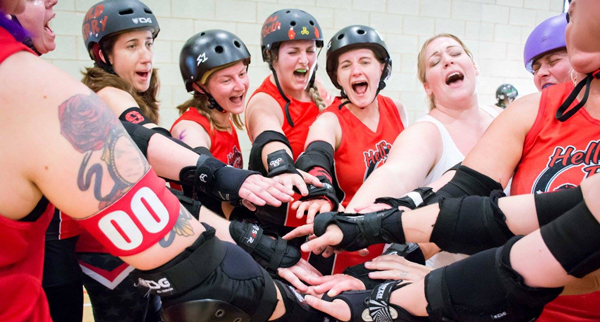 We would like to take this opportunity to give a heartfelt thank you to everyone who travelled all the way up to Norwich to support the Hells Belles, and to the Surrey Roller Girls who played an incredible game of derby and were a pleasure to play against. Also a huge thank you to the Referees & NSO’s who, without them, we would not be able to play derby in the first place. Thank you to all the other volunteers and announcers. Finally, to the Norfolk Brawds for hosting a fantastic bout day; you did a superb job, a day that was thoroughly enjoyed by all. For our next game we will be taking on the mighty Norfolk Brawds. Come along and cheer us on in our game on Sunday 9th July.